WHAT IS THE DIFFERENCE BETWEEN A PROTECTOR AND AN ENCASEMENT? A mattress protector covers the mattress like a fitted sheet. A mattress encasement encloses the entire mattress, typically using a zipper enclosure, to provide 360° protection for your bed. ARE YOUR MATTRESS PROTECTION PRODUCTS HYPOALLERGENIC? Yes, both our mattress protectors and mattress encasements are designed to be both easy care and hypoallergenic. ARE YOUR MATTRESS PROTECTORS AND ENCASEMENTS WASHABLE? Yes, all of our mattress protectors and encasements are washable. Simply remove the protector or encasement from your mattress, launder in cool to warm water, then tumble dry low. 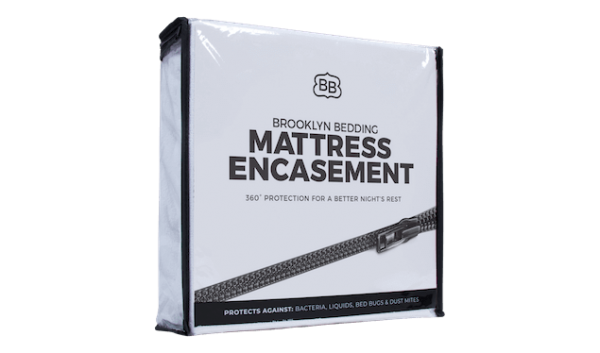 Because of its smooth top weave—specifically crafted to deliver cooling on contact—the Brooklyn Bedding Luxury Cooling Mattress Protector will enhance the breathability of a standard mattress and maintain the benefits of advanced cooling technology found in higher-end beds. While other mattress protectors and encasements are constructed of highly breathable materials, some styles may have a small impact on the overall breathability of your mattress as a trade-off for superior protection against allergens and fluids.